This soup is awesome! French onion soup is one of my favorite soups and this recipe is just as good if not better than you’ll find in many restaurants. A hearty bowl of this soup is a perfect meal for a cool evening. Gruyere is typically used in French Onion, but Alpine Lace is a great reduced fat alternative. 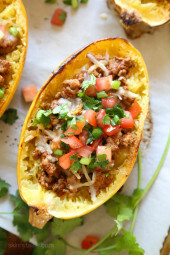 Some more of my favorite hearty soups include Broccoli Cheese and Potato Soup, Lasagna Soup, Chicken Pot Pie Soup, and Turkey Chili Taco Soup. In a Dutch oven, or large pot, sauté the onions with the butter over medium heat, until the onions are soft and golden, about 20 minutes. Add flour, mixing well another 2-3 minutes. Add thyme, bay leaf, sherry, wine and brandy, and simmer uncovered for 10 more minutes. Add the beef stock, salt & pepper to taste, reduce heat. Cover and simmer gently for about 20 minutes. Remove bay leaf and ladle 1-1/2 cups soup into 6 oven-proof bowls. Place bowls on a baking sheet. Place sliced toasted bread rounds into each bowl and top bread with cheese. Broil 2 to 3 minutes, until cheese melts. Hi Gina will you be posting instantpot directions??? Hi! Is it still 8 points per serving with Freestyle? Thanks! This remained the same 9 points. Thanks for the recipe. This has become my go to site. I’ve had great luck with all. Do you think it would work in the quick pot? Or would ithe sauté temp be too hot to carmelize the onions? I think it would be too hot. Any suggestions on how to convert to instant pot? This is very close to Julia Child’s recipe for onion soup and I have never tasted any that beat it. Enjoy! I just tried your bread-less French Onion soup from your cookbook. I've never tried parmesan crisps before. The whole recipe is amazing! I love your cookbook Gina. Thanks so much! We are working on a project and would like to know the sodium count for the French Onion Soup. I made this tonight for my husband and I. Followed the recipe exactly except I had some Gruyere cheese on hand so used a bit of that. It was absolutely delicious and my husband loved it. This will be my preferred recipe! In another slow cooker version of this soup I saw that you could add only the onions and the butter (they suggested using a liner) and cook on the high setting for 30-35 minutes. It said until the onions edges were starting to brown. Then mix dry ingredients together and add to the slow cooker with the broth. Cook on low 7-9 hours or High 3-4 (or until onions are very tender). Made this tonight for dinner. It was excellent! I didn't have wine or the brandy so I made it without those. Hi … can i leave out or substitute the alcohol? will it change/affect the taste? Hey for those of you who have done the crock pot, what time and temp did you do?? Can we use the left over aujus from your french dip recipe as the soup base? Seems to me it's pretty similar. This soup was delicious, I love the flavor that the sherry adds. Thanks for posting! Do you have any tips on turning this into a "condensed" version to use in dishes that call for a condensed can of french onion soup? This delicious soup is sitting on the stove simmering, just begging to be eaten! I can't wait to pop it in the oven, melt the cheese on it and give it a go! Gina, I just wanted to comment and say thank you so much for all the amazing recipes you have put up. They are all so delicious and I don't even have to feel like I am dieting because I still get to eat extremely tasty food. I'm proud of what I am eating and I want to share the recipes and the calorie count with everyone! I am not doing weight watchers but having a healthy alternative and calorie count for all of your meals has truly helped me. I have been "dieting" ,or as I prefer to call it changing my life style, since the beginning of December and I have already lost 31 pounds. I couldn't have done this without you and your incredible recipes! Thanks so much! How many points in the soup without the cheese and bread??? how many calories should the bread be??? Like 150-200??? Love your site…I make lot of your recipes. Gina, could this be made vegetarian? What reccomendations would you have for that. I am going whole foods, and this looks fantastic. Do you think you could freeze the remainder of this soup? There are only 2 of us so we don't need all 6 servings, but I know I will end up making this again so it would be nice to freeze the rest for a later date! what could i use instead of the cognac or brandy?? @Gina-do you think leaving out the brandy or cognac would change the taste significantly? For cooking wine I always say use what you drink! No particular brand on the Sherry either. What type of white wine would you recommend? I usually use a chardonay. Is there a kind of brandy or sherry that you recommend also that is good for cooking with? Thanks so much for the recipes!! I've never tried it in the crockpot, I would do the onion on the stove first. I'm making this tonight! To those wanting to make it vegetarian?? I once make a vegetarian French Onion soup, using portabello mushrooms and soy sauce. The mushrooms give it a beefy taste, as did the soy sauce. (you can try soaking dried mushrooms and then use the remaining liquid, or include the mushrooms in the soup). I think it would remain the same. Do you know how using veggie broth would change the points? Thanks for the tip, I was stumped on how to answer but that sounds like a great solution! Anonymout – fellow vegetarian here. Try this tip: If a recipe uses a beef broth you can turn vegetable broth into a vegetarian "beef" broth by adding 1 cup vegetarian Worcestershire sauce and about 1 tablespoon soy sauce to every quart of vegetable broth. is there any way to make this a vegetarian recipe? Will it work with vegetable broth instead of beef broth? I've never really cooked with brandy or dry sherry, can you suggest to me which brands of those are affordable but can be used again? Looking forward to making this next week. It worked out great with just the wine and sherry! I didn't have oven proof bowls, so I broiled the bread and cheese and then let them sit on the soup a little bit before serving. YUM!!! Can't wait to have a bowl for lunch tomorrow! Rebecca, I personally like the flavor the brandy adds to the soup, but you can certainly make it with wine and sherry instead. This sounds great, we'll have to try it once the weather begins to cool again! What we've done for FOS before is brush the bread with a little e.v.o. oil, and then rub garlic cloves and sprinkle parsley over top before baking. It adds a hint more flavour and smells delicious! My husband and I are not really into alcohol, so I usually just keep cooking wine handy. Any chance I could just use white cooking wine and sherry? Is the brandy necessary? gina-thanks for the great recipes! My husband loved this! I enjoy a glass of wine with dinner (extra points), so I always try to find ways to cut points in recipes…I nixed the butter in this recipe, used a little butter cooking spray and covered the onions. The water from the condensation helps the onions brown and you don't miss the butter at all!!! Just a cool trick I saw on the food network I wanted to share! Good luck to everyone on WW! I'm down 10 with 20 to go! This was DELICIOUS! 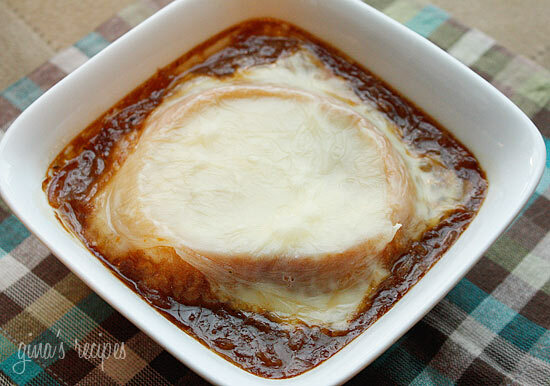 My husband is the French Onion soup lover, this recipe made me a lover too! Will regular swiss drive the points up a ton? I had to shop at wal-mart and they do not have the alpine lace. I made this last night and it was so fabulous! I will be making this again for sure! You're welcome Kathy, I don't know that you would get that same great taste, why not use less butter or a light butter? Gina, thank you SO much for wonderful recipes! My partner and I are having great weight loss success largely due to your recipes! They fill our weekly menus! Can you offer an alternative to cooking the onions in so much butter? Would cooking spray work if you are using fewer onions for a smaller batch? @Shelley- ha, there's an idea! I sometimes omit the bread but the cheese falls into the soup a bit, I like the onion ring idea! If you could do with out the bread, but that is what makes the cheese stay, why not replace the bread with a BIG ring of onion, Honestly that is what I thought it was just by looking at the picture. 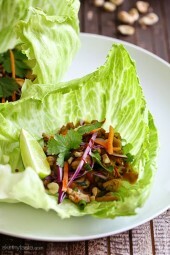 Time to get back on the WW wagon and your recipes will have me cooking even healthier for the rest of the family! Thanks-maybe I will soon have a recipe as special as your most recent one- getting a few pounds off might be just what I need! 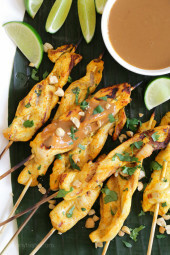 @ Patrick- thanks for all the kind words and always leaving your honest opinions on my recipes! I agree with you, this soup has such a comforting feeling. You can freeze the broth and just make one bowl at a time if you wish. I just found your site because I just embarked on my journey to lose nearly 100 pounds. Thank you for all the delicious-looking recipes, the gorgeous pictures, for offering some healthy food choices that my family and I might actually eat. OK, so I had to make this tonight. I don't know what I'm more addicted to – the success I've had with WW or Gina's recipes. OK, it's Gina's recipes – because I think they're the reason for my success! I know I'll reach goal! You simply MUST TRY THIS RECIPE. It will bring back memories of fancy restaurants and a bygone era. What a terrific blast of comfort on a cold night. Such a pleasure to be able to eat fantastic, completely satisfying foods while losing weight at the same time. Not a single recipe on this site I haven't been thrilled with. Oh you all are so right about the cheese! Sadly, I'm lactose intolerant…my body can handle the butter, but not the cheese 🙁 I really miss that stuff! Yum…I love french onion soup! Can't wait to try this. Patrick, I couldn't agree with you more! The bread I could do without, but thats what keeps the cheese in place. 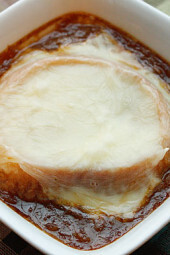 The cheese and bread on French Onion Soup is worth every delicious point!! Looks terrific! Hi Sarah – If you take the cheese and bread away it is 3.5 per serving. The cheese adds an extra 2 points, the bread an extra 1 point. How many points per serving will the soup be if I nix the cheese?